La Estancia Oceanfront Villa 1201 (2nd floor) on Nuevo Vallarta Beach offers the discriminating guest tasteful elegance with 3,352+ square feet (3 bedrooms& 4 bathrooms) of comfortable beach front luxury where you can enjoy the spectacular views of Banderas Bay from your private balcony. 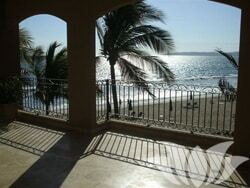 You are only a 20 minute walk on the beach from the town of Bucerias. Concierge service is available to help you plan every aspect of your holiday and make it a truly memorable experience.3 Bedrooms Ocean front 1201 combines the spaciousness and comfort of a home with the conveniences and amenities of a 5-star, full service resort.